Are My Shoes Pointed the Right Way? ...or pointed enough? I wish I could get a photo of all the pointed shoes, but I think I might be a little offensive if I began to take them as I am walking on the "Bulvar"! Not just women's shoes, but men's as well. Maybe that is why we saw so many shoe stretchers in the local Walmart "have everything" store! Yesterday, it wasn't my shoes that needed to be pointed in the right way! We were driving through the city attempting to find, yet, another supermarket. This is a rather compact city so you are never really far from anything, but when you are in a car, it seems farther just get to the next block. If we had been on foot, we would have found it so easily.....oh, wait....we did park the car and join the foot traffic in the cold, wet rain, later, to find that we had been only two blocks away from said supermarket. We returned to our warm, dry car to attempt another go at some one way streets. I called a new friend that has been to said supermarket hoping to be pointed in the right direction....her directions were perfect with all sorts of landmarks, but her explanation became clear as mud in my mind as I tried to direct my very patient husband who was trying so hard not to go down a oneway street the wrong way, but was apparently the street we needed to travel. While at home, I searched some maps of the city that I have been collecting. On one of them, said supermarket had been marked as in "X marks the spot"! I am thankful that I listened in geograhpy class, at least, on map skill day....do they even teach that anymore? ...there was no way to tell, but some of us have a conscience, spend the night tossing and turning in bed, and blog about it the next morning...this is my confession, if one is needed, and now I am redeemed....OK? You may wonder why I was so adamant that we find that particular supermarket. If you know me well, you know that I am a mission shopper. I want to know where everything is and what I can get there...and I want to know NOW! Actually, someone told me that above that supermarket there was a furniture store that might have a coffee table that I need. The furniture store did have a bigger selection than I had previously seen, but not what I am looking for.....but I have an idea! ...that I think I can use for decor that are really for another purpose! Are you surprised? Did you think that I wouldn't come up with projects just because I wasn't at home? After we returned to our disorganized, box filled apartment, we set about to unpack some more boxes and make some sense out of the chaos. I was in my element....decorating, staging, nesting....until...at the end of the evening, as I sat down on the sofa to revisit our day....I was reminded by the noise of the street that I was not in Kansas Texas anymore wearing red glittered shoes flipflops....for just a brief few hours, I had forgotten that I was not at home, but I am making a new home, in new surroundings, with new sounds, yet, still pointed in same direction...heavenward! If the shoe fits, wear it well! Where Were My Rainboots When I Needed Them? 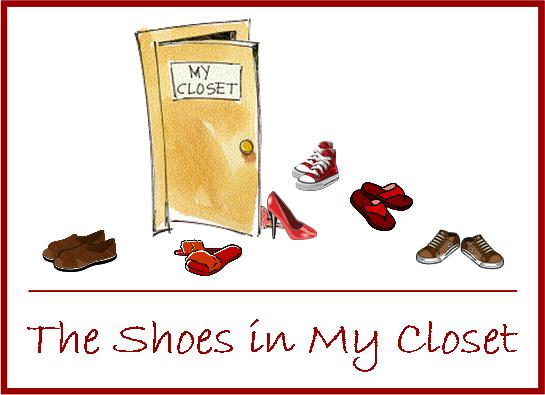 ....in my closet, of course, among "the shoes in my closet"! Those rainboots now have a new home....in the floorboard of our Baku SUV! A couple of Saturdays ago, (we were without internet for a few weeks while waiting for it to be installed in our new apartment so I am behind in my blogging) we went on our first grocery shopping adventure....that's right an adventure! Each store specializes in certain items, stocking only certain brands, so several stops must be made to gather supplies. With most packages written in a language we don't speak, much less read, everything is a guess. So the guessing game we play, spending a lot of time wearing our American shoes walking the aisles searching for our needs. No labels to decipher, no words exchanged, no rainboots...just smiles, lots of laughter...and multiple sacks full of beautiful fruits and vegetables to satisfy our hunger!